With the Exploration Flight Test -1 (EFT-1) mission now at the T-15 months stage, Orion teams on land and at sea are deep into preparations for the key test of NASA’s next exploration spaceship. Major test milestones include the evaluation of sea recovery assets, Kennedy processing and stacking, parachute testing and heat shield preparations. The EFT-1 Orion was born in the summer of 2011, as engineers at the Michoud Assembly Facility (MAF) began welding together the crew module. The module was then shipped to the Kennedy Space Center’s O&C (Operations & Checkout) Building in 2012 for an estimated 17 months of outfitting operations. One of the recent milestones included the successful pressure and static load testing, proving the capsule should be able to cope with the stresses it can expect during launch and in space during its EFT-1 mission. The successful test also validated a small area of repair on the spacecraft, after cracks were found during the initial pressure testing last November. Since the small defects were found, engineers have reinforced the area of the aft bulkhead with doublers, adding structural integrity. The repair was validated during recent testing that pressurized the module to 110 percent of what it is expected to experience in space. The associated load testing was conducted inside a 20-foot-tall static loads test fixture, allowing for hydraulic cylinders to slowly push and pull on the spacecraft to mimic the types of stresses Orion will experience during EFT-1. The spacecraft received loads ranging from 14,000 pounds to 240,000 pounds, measured by 1,600 strain gauges. The team successfully completed eight loads tests on the crew module, with initial results showing no critical anomalies. In addition to the loads testing, engineers and technicians completed a series of pyrotechnic bolt tests on an Orion Ground Test Article (GTA) dummy module in the Launch Equipment Test Facility at KSC. These tests were used to assess shock levels generated by separation events, along with their impact on the capsule’s tiles and surrounding components. Over in the nearby Vehicle Assembly Building (VAB), the Orion Lockheed Martin team have been given the option of stacking the Launch Abort System (LAS) on the EFT-1 Orion inside the famous building’s Transfer Aisle, ahead of the stack being transported to Cape Canaveral for integration with the launch vehicle. “The EFT-1 Off-line LAS Integration trade meeting concurred that the VAB was a viable option to perform the EFT-1 LAS stacking and that option should be made available to Lockheed Martin. 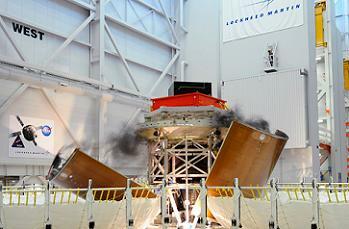 LM is also considering other off-line integration activities,” noted L2’s EFT-1 Update Section. As previously reported by this site, the Delta IV-Heavy launch vehicle that will loft EFT-1 Orion on its test mission is over 50 percent complete during its build-up flow at the United Launch Alliance (ULA) factory in Alabama. Photos (L2) of the EFT-1 Delta IV-H show the vehicle undergoing its fabrication effort on the propulsion tankage for the rocket’s four major components: Center Common Booster Core (CBC), Port CBC, Starboard CBC, and the DCSS (Upper Stage). 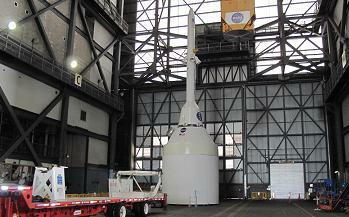 The EFT-1 launch vehicle’s “major assemblies” – such as the stages – will be delivered to KSC in March 2014, with stacking on the launch pad beginning in July. Testing for key events both during ascent and re-entry continues to take place, such as the recent test relating to the jettison of Orion’s three protective fairings – each 14 feet high and 13 feet wide – which will take place around the 560,000 feet point of ascent during EFT-1. According to NASA, the first test – conducted by Lockheed Martin at their Sunnyvale facility – resulted in all the pyrotechnic mechanisms and bolts separating as planned. 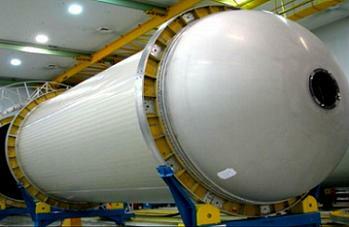 However the third fairing panel did not completely detach – likely due to a potential contact interference. Evaluations will take place ahead of the second test, scheduled for later this summer, which will add expected thermal loads by heating one panel to 200 degrees Fahrenheit. 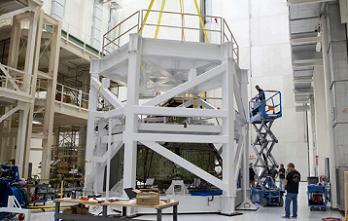 A final test will be performed early in 2014. A major milestone near the end of the mission will gain vital data into how the heat shield performs during the high energy re-entry – a Thermal Protection System (TPS) that continues to be prepared at contractor Textron Defense Systems. The company recently completed the first round of gunning cycles on the shoulder sections of the heat shield, filling approximately 25 percent of the 320,000 cells on a honeycomb overlay. The honeycomb provides structural reinforcement for the ablative Avcoat material which is bonded to the heat shield’s carrier substructure to protect Orion during re-entry. 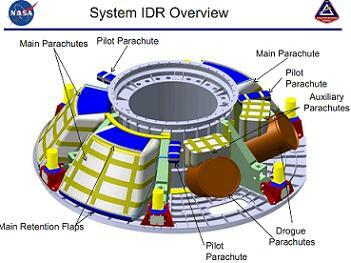 Once Orion completes its re-entry, parachutes will safely slow the vehicle down, as it heads for its splashdown in the Pacific Ocean. Work has been ongoing via the Orion Capsule Parachute Assembly System team, with the latest success – the Parachute Test Vehicle-4 air-drop – involving the rigging of one of the test capsule’s three main parachutes to skip one stage of its inflation, placing additional stress on the vehicle as it opened. Most of the recent tests have involved off-nominal parachute deploy scenarios, allowing engineers to ensure a level of margin is available, should an Orion suffer from a problem during this critical part of the mission. The next air drop test is currently scheduled for July 24. 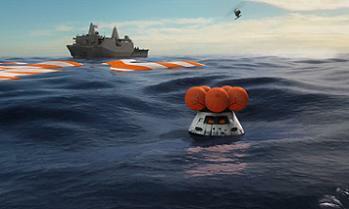 Once in the water, EFT-1 Orion will provide the first real test for the recovery forces, which includes the US Navy. Per ETF-1 L2 information, a “Landing and Recovery Underway Test” Technical Interchange Meeting was recently conducted in San Diego, with the intention to continue coordination between the DoD (Department of Defense), L&R (Landing & Recovery) teams, and the Orion Flight Test Management Office, to ensure the teams are ready to support the test. As previously reported by this site, the US Navy will conduct an Orion recovery exercise, scheduled for August 2013 – set to take place at Naval Station Norfolk, in Virginia. 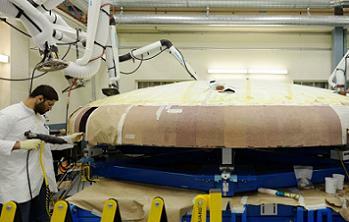 The second major test is planned for January 2014 – at Navy Base San Diego in California. These two tests will prepare all related teams for the recovery of the EFT-1 Orion and allow for lesson’s learned ahead of the Exploration Mission-1 (EM-1) and more importantly the first crewed mission, EM-2.